Doug recorded this review a couple days ago (I’m sure why he didn’t post it… probably because of the light in the background that I forgot to turn off!). Either way, I really like Today ToDo Pro so I thought I would pass it along. I am constantly on the quest for the perfect todo app and this one really sticks out among the rest. The interface is simple and very unique, it has the features I’m looking for in a todo app and it is well designed. Check out Doug’s video review below. 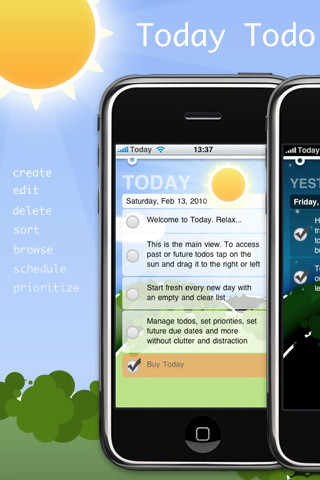 I had been looking for a long time, when I found this app, for a task list app I could use for repeating tasks. This way I don’t have to write my list over again or uncheck every task. Once you check off everything, you tap the refresh button in the bottom left and it resets the list. You can also make more than one list. You can drag around lists to reorder them and individual items within the lists. 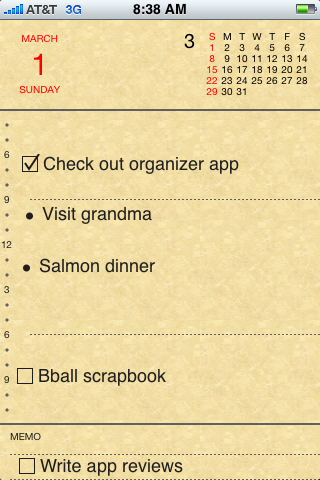 This is a big feature for me too because if a task suddenly becomes high priority I can drag it to the top. The icon for the app supports badges and the number represents how many tasks are left in the currently opened list as default. You can make it show only lists you favorite or all lists or none. Overall, I like this app because of it’s simplicity. It just works. This applications is on my first page of my iPhone.